Named after a racetrack and a city in the Netherlands, the new Dainese Assen Perforated Race Suit is looking to be the new go-to sub $1000 one piece race suit for the next track season. This suit offers a full protection package, with CE approved armor at the shoulder, elbows,and hips. With the added bonus being that the entire Assen suit is CE Certified. So you can rip up the track or the street with confidence. The NanoFeel liner inside of this suit is fully removable, so it can easily be dropped out and cleaned. The full-size race hump will help keep the aerodynamics in check while hurtling down the straights, and full perforations will keep you cool when the temperature and the workload rises. 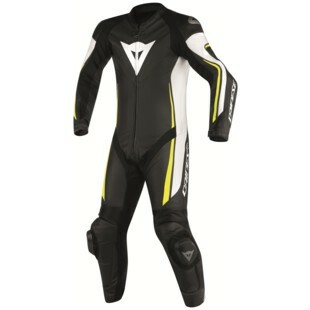 Despite the fact that this suit is packed with modern safety, Dainese has retained a clean and classic look. It has minimal branding and should look good on any race-oriented machine, whether on the street or the track.